Today’s jobs report provides yet more evidence that this is a recovery in name only. The 9.2 percent unemployment rate is certainly a serious problem, but you can understand the problem a little better by looking at the percentage of working-age Americans who are actually working. This percentage declined again to 58.2 percent in June, and is well below what it was when the recovery officially began. 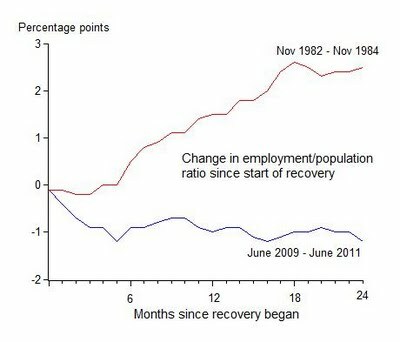 The chart below shows the change–during the 24 months of this so-called recovery–in the percentage of people working and compares it with the recovery after the most recent deep recession of 1981-82. You can see the general recent decline. In contrast the percentage of people working rose sharply in 1983-84. So this time there really has been no recovery in the labor market. The chart also tells you what might have been. For example, if the employment to population ratio had increased (rather than decreased) in the past 24 months by as much as it did in the 24 months following the 1981-82 recession, then 8.9 million more Americans would have jobs than actually have jobs. Yesterday the House Budget Committee released a report on the jobs problem and, while mentioning several explanations, argued it is due to an economic policy problem, including the increase in the debt and deficit caused in part by the stimulus packages and spending boom of the past few years. My Bloomberg News column of yesterday shows that the Keynesian revival, which has its ten-year anniversary this month, hasn’t helped.